First post of the year, talking about something that I have never-- my most sought-after beauty products. To tell you the truth, I keep it pretty simple with beauty products and avoid splurging on dozens of products that will eventually end up in the bin. And although I love to experiment, with hair and skin, I try not to. So here's a list of beauty products that I have recently started using (for about 3 months now) and will definitely use for years to come. I bought all these products mentioned in Melbourne but most of them can be found in India. Now that I'm tending to my 3 month old niece, I HAVE TO wash my hands at least 50 times a day (plus sanitize another 20 times) which can really dry out my hands. Luckily, my sister got a bunch of hand products for her baby shower (which I kinda stole) and thank god for that! 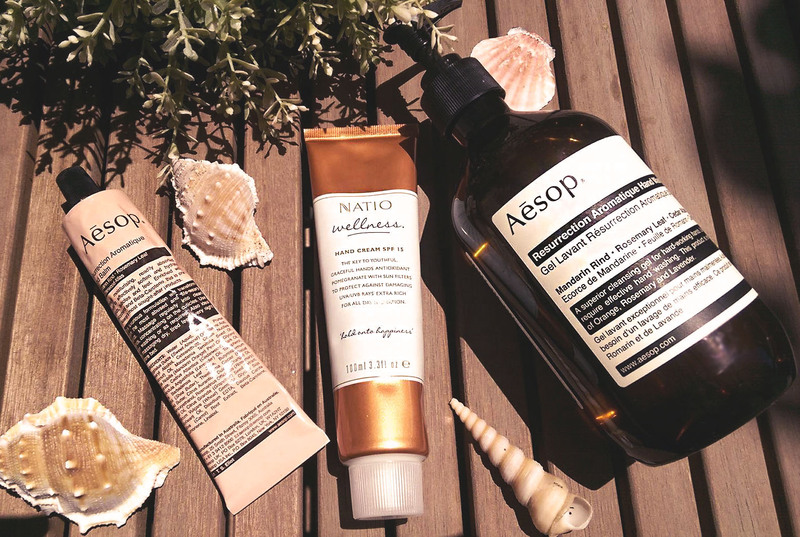 Aesop- Started from humble beginnings in Melbourne, Aesop is now a leading beauty brand in the country, making it's way into every Aussie's home. The most popular product, the hand balm is an incredibly thick, moist and fragrant hand cream that heals those life-weary hands. I found my hands were softer with every application. The accompanying hand wash is super light and does not dry hands, unlike other washes. Both the products' smell can be quite overpowering at first but overtime you fall in love with the aromatic fragrance. Your skin will love these products like never before and maybe that's why they don't come cheap. Natio- A good hand cream is one that is moisturizing for long hours and has a breathtaking fragrance, and Natio's hand cream is one that does both like a star! A great travel companion with beautiful packaging and inexpensive, easily making it on my favourites list. All of yous back home can shop Natio products at Nykaa. Melbourne's weather is never constant but one thing that remains is the lack of moisture in the air and such conditions often leave the skin dried and lifeless. I had to change my skincare routine after coming here to adapt to the drying weather--which is exactly the opposite to Mumbai's. Goodness- A super light and incredibly moisturising face cream that I've been using ever since I've come to Melbourne. It's not greasy, therefore does not cause your skin to breakout. It's core ingredients are au naturale with chia seeds being it's main moisturising component. And to complete the 'why is goodness so good' list, it's pocket friendly. 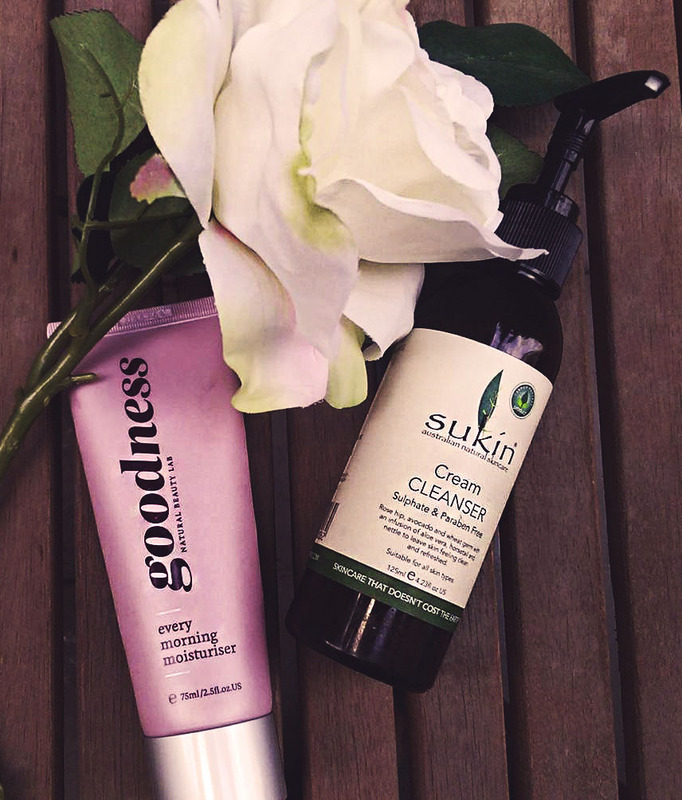 Sukin- This creamy face cleanser is filled with all things organic and has a slightly thick consistency. And since it's a cream cleanser it doesn't leave my face dry. Great for daily use, except when lots of makeup is on. On those days, it's best to remove makeup with a wipe and then wash it off with Sukin. My relationship with my hair is the most troubled and after coming to Melbourne it never seems to listen to me. Due to weather and water change my hair reacted horribly, breaking and falling every time I stroked my fingers through my hair. However, thankfully, these products have somewhat saved my dying hair. OGX- I've been using it for over 5 months now and I don't think I'll be stopping anytime soon. 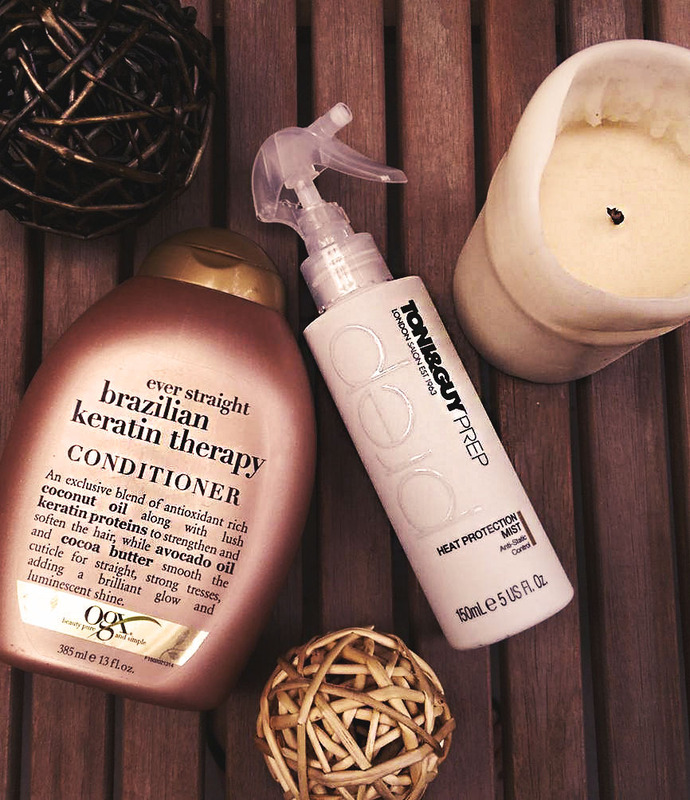 OGX products aren't new to me and I often rely on these products to resurrect my damaged hair. Their cute packaging and use of organic products convinced me that this is it! I particularly like this conditioner as it's is moisturising, de-frizzes my locks and makes them smoother than ever. It has all the ingredients for luscious, shiny hair. Also, it smells GREAT! Peeps back in India can shop OGX products at Nykaa. Toni & Guy- Earlier I would think that it wasn't necessary to use heat protection, till my hair started falling and I was slowly becoming bald. Then I was like, "That's it! Time to get my sh*t together and fix my hair." I picked up this Toni & Guy hair protection mist and I've found that my hair falls lesser now when I blow dry or straighten my hair. Plus it doesn't dry out my locks! This can be found at any Toni & Guy salon or any other leading salon in India as well as Health and Glow.